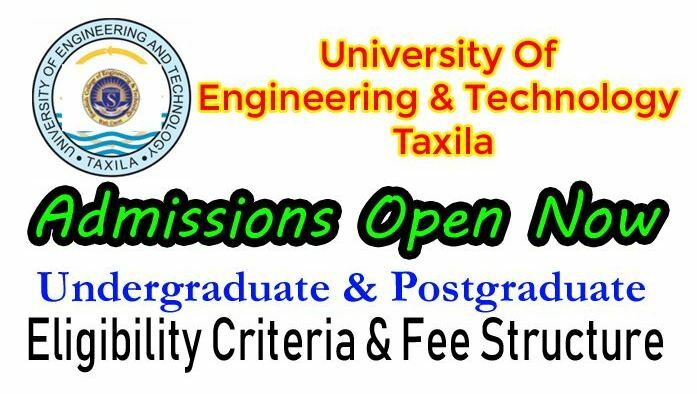 University Of Engineering & Technology Taxila Admission 2019 are now open for all the undergraduate and post-graduate programs. If you are one who is going to apply for admission engineering and technology university taxila then you should read all this article to get information about UET Taxila Admission 2019. You can get complete details list UET Taxila Undergraduate admission 2019 last date, entry test, merit list, fee structure etc. UET Taxila offers admission twice a year in which thousands of students apply for admission but only lucky ones are granted with admission. If you are sure that you got flying marks and will be on merit then you should apply for UET Taxila spring 2019 admissions. University of engineering and technology UET Taxila is one of the top engineering universities in Pakistan by HEC ranking. University offers many engineering programs for regular and self finance basis. Here at webstudy.pk you can get complete details about each university in Pakistan admission dates, process, entry test, form download and merit lists. UET taxila provide all the basic facilities like transportation, clean class rooms, library, air conditioned labs, canteet, highly trained sraff, well educated faculty that delivers lecture with great passion. UET Taxila Postgraduate admission 2019 are now open for all the students who wants to get admission. Along with undergraduate and post-graduate university offers PhD programs as well. Candidates are advised to submit their application forms till last date so the admission process begen. Last coming or false information providing may lead you to cancel the admission so fill the admission form with great care. After that university will conduct entry test and then annonce the merit list of selected candidates list who will be granted with admission. A candidate must have to pass the intermediate FSc Pre-Engineering with minimum 60% marks to get admission in undergraduate programs however students who are desired to get admission in computer science, software or telecommunication or electronics then they should have read maths and computer science in intermediate. Moreover students have to pass the UET entry test of which marks will be included in merit list. Every department have different admission criteria for admission so you have to visit concerned department to get eligibility criteria details. Candidate must have to pass the test by PEC or PCATB and must have authorized degree from well recognized institute with minimum 3.0 CGPA or 1st Division in annual system. Candidates must have completed 16 years of education and also have done msc with 60% marks from recognized institute. More details you have get from your concerned department as every department have different criteria. If a candidate have completed 17 years of education with first division in msc or mphil then they are eligible to apply in phd programs. You can get the prospectus from university campus or you can download it online from www.uettaxila.edu.pk for free. Fill the form with great care because mislead may be result in cancel the admission. You can also read the prospectus to get informed about uet taxila rules and regulations. You have to submit the admission processing fee in bank and have to attach the challan copy with application form and required documents. Lastly you have to send this application form to the admission office. Last coming form will not be entertained so try to submit your forms as soon as possible. Note That all this information related to UET Taxila admission 2019 is collected from different online sources but for authentic news & updates of UET Taxila spring 2019 admission visit official website. You can also download free guess papers, model papers, past papers & important notes of each class and subject from here at webstudy.pk.